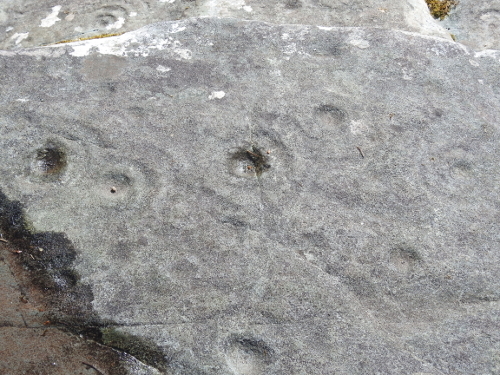 The Bohea Stone is one of Ireland's most important neolithic rock art sites. Despite being in among the ruins of a farmhouse and former outbuildings, the location is due for redevelopment by Mayo County Council, and planning permission was sought in 2014 for a new infrastructure which will protect the stone and make visitor access easier. Located south of the busy tourist town of Westport, and set among rugged and impressive landscape, the Bohea Stone is a national protected monument in state care. 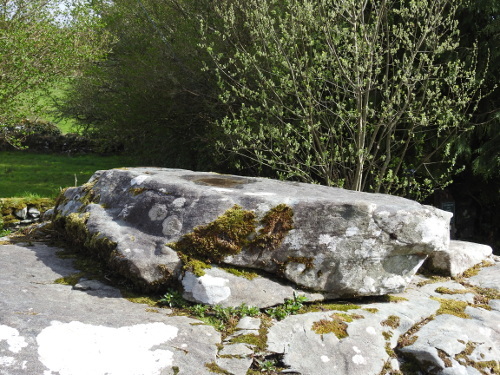 The stone itself is a large natural outcropping with a sizable white quartz seam (common to many Irish megalithic structures) running through it. The top of the outcrop forms a natural platform or altar. This would have been the ceremonial plinth for the shaman, and later druid, to perform rituals upon while being surrounded on all sides by rock art atop a powerful quartz charge. Discovered to be a neolithic site in 1987 by a Mr Gerry Bracken, how such a spectacular example of rock art had not be found until the late 1980s is a mystery in, and of itself. Like so many sites in the west and north of Ireland it has been renamed ‘St Patrick’s Chair’, via Christian cultural appropriation. Even so, the stone contains some of the finest collection of over 250 petroglyphs rock art designs spread over its surface area. Generally they are in the form of ‘cup’, and ‘cup and rings’ designs and clearly suggest a celestial influence. 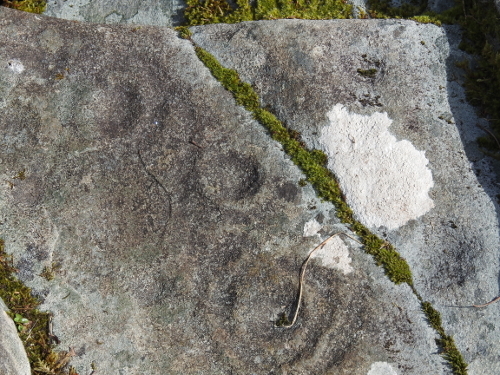 Perhaps star maps, with the rock representing the aspect of the cosmos being brought down to earth and creating a connection between this material world and other realities. In Swedish and Finnish folklore the cup marks in ceremonial standing stones were used to place seeds within during the start of the growing season as a gift to the fairies. This idea is also plausible when applied to the Bohea Stone, in that the sun rolling down the sacred mountain of Croagh Crom (Croagh Patrick to the Abrahamic importers) at the start of the planting season (April 18th) and the commencement of the harvest (August 24th) is only view-able from the platform atop the outcropping. The mountain or 'Reek' itself is deeply symbolic, as it is the site where Saint Patrick is said to have converted all of Ireland to Christianity in 441AD. 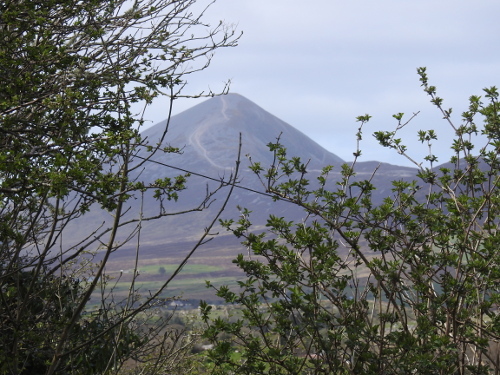 The mountain had been previously been known as Cruachán Aigle, which has been translated as the 'Rock of the Eagle' and was, before Christianity, associated with the mysterious Crom Cruach. Portrayed by medieval scribes as a dark pagan cult obsessed with human sacrifice and hunting down peaceful Christians, the entomology of their name suggests the Crom Cruach were more of a fertility and solar sect. Crom was the last pagan god worshiped in Ireland and this spiritual tradition, along with Crom followers were ruthlessly hunted down and persecuted by Saint Patrick and his Roman supporters. However, not entirely it would seem. An interesting inclusion within the fourteenth century manuscript the Book of McGovern—states in poetic verse—that the Crom Cruach were still in existence near Kilnavert, in County Cavan almost nine hundred years after Saint Patrick is said to have rid Ireland of the sect. This 'fertility cult' aspect appears to have been validated with the discovery of the Bohea Stone and its seasonal alignments within the heart of Crom country. Interestingly, the small Christian chapel which is now on the summit of the mountain is still referred to by locals as 'An Teampall' or in English, or 'The Temple'. Sadly the Bohea Stone has been desecrated over the years with tacky Christian and other obnoxious government additions, however, these should, and will be properly removed when the visitors center construction commences. All photos below by Thomas Sheridan taken April 10th, 2017. The 'Reek' as Seen from the Viewing Platform. 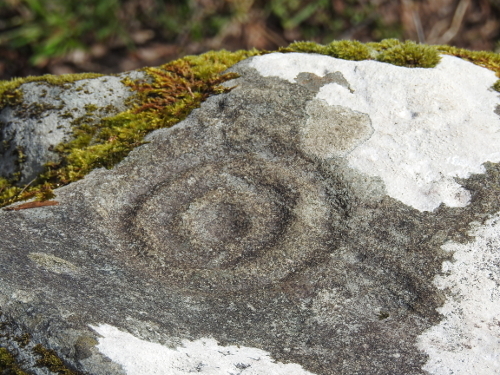 The Bohea Stone in County Mayo, Ireland is a classic example of magical outcropping, with its scores of rock art designs carved into its surface. Each design fine tuning the electrical charge created by the massive quartz seam at its base. Even today, it is not hard to envisions a neolithic shaman, standing atop the natural platform on the Bohea Stone chanting in the direction of the stars—or the setting and rising sun—while surrounded by hundreds of people. Perhaps each rubbing two pieces of quartz together in unison with the magical invocation, as the sparks they produced—by the electrical charge inherent in the quartz—lights up the twilight vista of the landscape. While also illuminating the psychic vista of each and every person present. 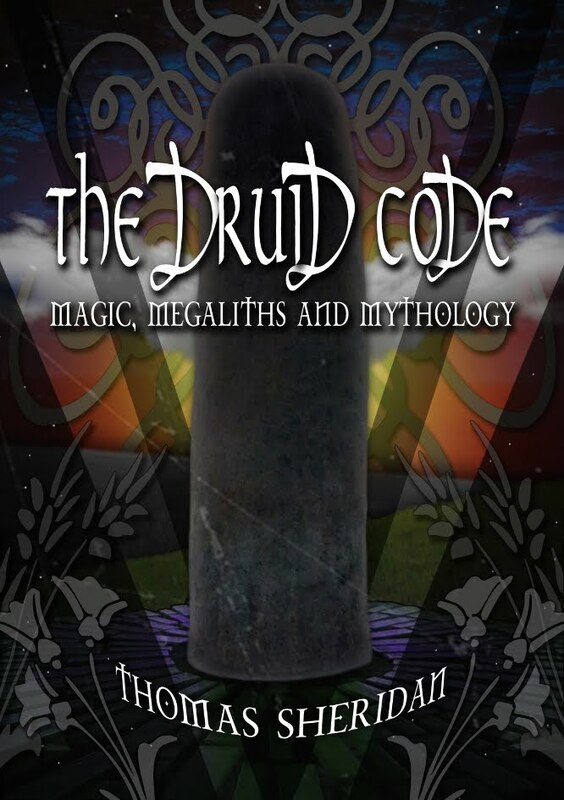 The shaman or druid chanting—perhaps in celestial salutations—as he or she becomes the focus of this collective charge so as to project their consciousness into other realms and dimensions of space and time. Curious if any of your research supports the concept this swami tradition holds that these spirals represent the mystic spiraling down from Universal to individual and back up again when the incarnation process has been completed, no matter how many turns on the wheel of birth and death that may require, the spiral appearing the same when put on a rock whether seeing it from the Universal or the individual points of view. 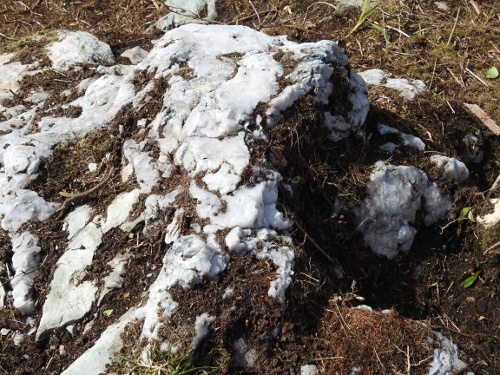 Interesting article about the rock formation that I surveyed as the Boheh Stone and about which I published an illustrated paper in CATHAIR na MART - the Journal of the Westport Historical Society (No. 13 - 1993). In this paper I also mention that this site was already described by G. H. Kinahan in 1873.